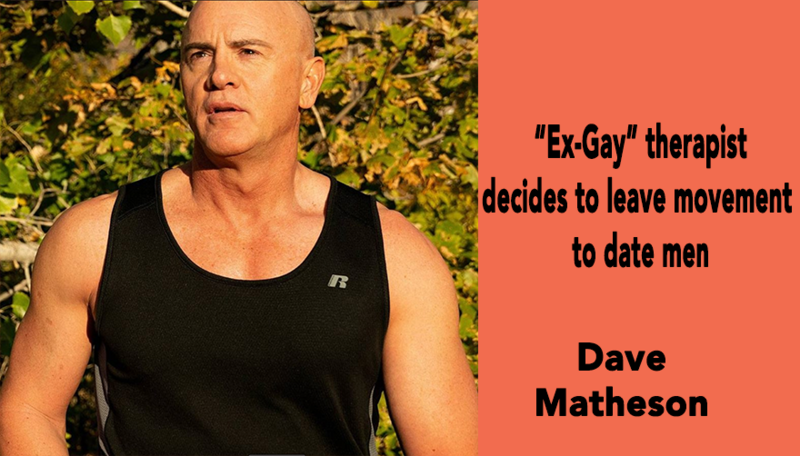 WASHINGTON – The nation’s most notorious conversion therapist, David Matheson, has quit the “ex-gay” movement and has announced he is seeking to date men. Matheson is the author and creator of several infamous “ex-gay” programs and bogus studies, as well as director for the Center for Gender Wholeness. Matheson has been featured in ABC News and The New York Times. Journey into Manhood’s director, Rich Wyler, revealed the news in a post to a private Facebook group obtained by Truth Wins Out. “David…says that living a single, celibate life ‘just isn’t feasible for him, so he’s seeking a male partner,” according to Wyler’s statement. “He has gone from bisexuality to exclusively gay.” TWO contacted Matheson on Sunday evening and he provided a statement that was surprisingly unrepentant and failed to apologize for the grave harm he has caused many of his clients. While the latest news on Matheson further dishonors the already discredited “ex-gay” industry, some people harmed by his programs have greeted his announcement with mixed feelings. “While I am pleased for Mr. Matheson that he has found a path forward for his life, I can’t help but think of the hundreds if not thousands of people who are still stuck in the closet, a closet that was created in part by Mr. Matheson himself. I hope that Mr. Matheson will do whatever he can to rectify the harm that he’s inflicted on many people in the LGBTQ community, myself included,” said Chaim Levin, who was psychologically harmed by attending Journey into Manhood, and was later a key plaintiff in the landmark Southern Poverty Law Center lawsuit that shut down Jews Offering New Alternatives to Homosexuality (JONAH). Matheson was also tied to JONAH. TWO says that Matheson is living proof that these programs don’t even work for its most vociferous advocates. Matheson’s revelation is also important because Google is hosting a noxious “ex-gay” app targeting children. Truth Wins Out has launched a petition urging Google to drop the app, which has 45,000 signatures and counting.